Travel West Midlands have received over 700 new vehicles in the last five years. The latest arrivals are Volvo B7/Plaxton Presidents, represented by 4030 (V430MOA). There are nearly 200 Mercedes 0405s in the Travel West Midlands feet. Seen here in Birmingham is 1559 (R559XOB). Your bus - our livery. 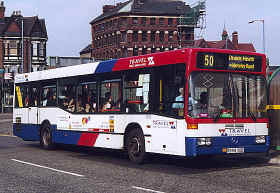 For several years Your Bus competed with TWM until it was purchased by them in the mid 90's. Their R479XDA, a Volvo B10L/Wright, is seen in an adapted corporate livery. DAF/Spectras have not been bought by many operators yet. TWM have over 20 - one of which, 4014 (T414UON), is pictured here. All photographs taken in Birmingham in July 2000. Click to enlarge.